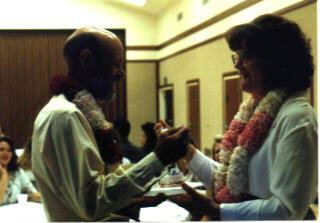 Linda and Peter met in Vacaville, California, where Linda was stationed at Travis AFB in April, 1996. 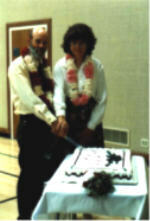 By August of that year they decided that they should become permanent partners, so were married on 24 August, 1996. These photos, (it should seem obvious) were taken on that occasion. In July of 1997 they moved to Pleasanton, Texas under Linda's PCS orders. This meant of course that Peter, who was now a "Military Dependent" had to terminate his employment at Winters, California, where he had lived and worked for the past 14 years. However, they were pretty glad to move into one house, because for the previous 10 1/2 months they had still lived in separate houses some 22 miles apart, each "visiting" the other's house on a nightly basis, or whenever they had a day or two off at the same time! After nearly 3 years at Lackland AFB, where Linda worked at Wilford Hall Medical Center, she received orders to PCS to Yokota Air Base, near Tokyo, Japan, where they now live. Disclaimer notice: This web site has no commercial purpose whatsoever and is for the private noncommercial use of my family and friends only, as well as being a college class project. All the photographs posted here are my own and are for the use of family and friends only. Any other use is prohibited. The gif graphics used were obtained by free download from [http://www.barrysclipart.com/clipart/index.html?start=46&gid=16980] and [http://animfactory.com/]. All text content is by the author, Peter A. Burr.